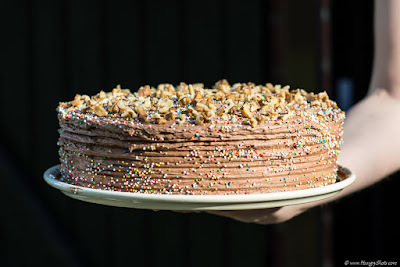 This recipe has its roots in my childhood and I can call it THE CAKE. Almost for every anniversary or birthday, my mother was making a variation of this cake. 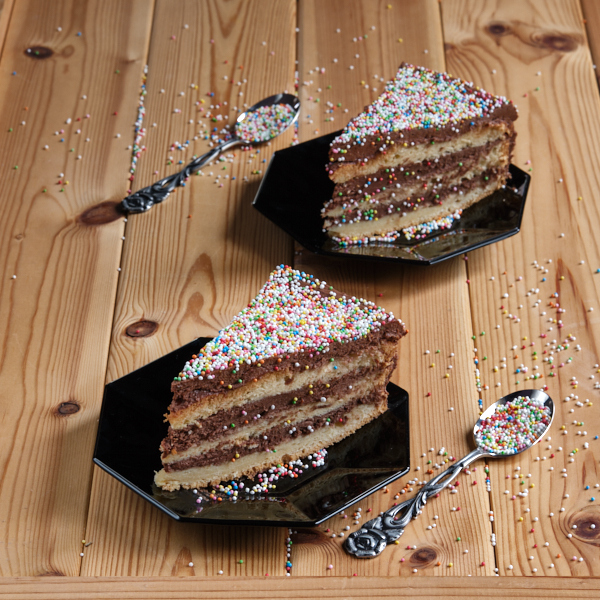 I have deeply in my mind the moist texture of the cake in rum syrup and the chocolate taste of the filling. The nuts on the top were crunchy and adding an extra taste. Later, when I grew up, I was kind of bored of the same old cake. Since then, I have tried and loved other recipes but none of them reached the popularity of this cake and it was like something was missing. Recently, of course with the occasion of an anniversary, the memories of that cake were suddenly invading my mind. I put my hand on the phone and called my mother. She recalled of course the famous cake but she was not recalling the recipe. I was astonished. That cake recipe hat was so popular and done dozens of times, my mother didn't know it by heart. It is probably the thinking of a child considering her mother as a superhero. Or it was just that when the cake was not so regularly done the recipe was forgotten. Nevertheless, she recalled very well her red notebook that was her bible in the kitchen and she has found back the recipe for me. I did the recipe and found that was not at all the most simple I've seen but not that complicated either. Doing the recipe was like returning those years of my childhood. I felt something like a fear in doing it. I was afraid that doing it and tasting it afterwards could have destroy my sweet memories in case it was not the same. I had to follow the recipe line by line, gram by gram to be sure I was getting the same as my mother's. The first occasion of this cake was the name day of my husband when we were expecting some friends to come over. Another reason why my cake couldn't have failed. Since then, I have redone this cake for the New Year. In both cases, although the cake was successful, I have found that the taste was not as I remembered. The power of memories is impressive. I can bet that if it would be possible to taste back the cake my mother was doing during my childhood it would taste the same as mine. But in my mind, the taste was much stronger then it really was. However, it is impressive that with just a bite of cake you travel through time and relive a moment of your childhood. Beat the egg whites with sugar. Add slowly the yolks, flour and baking powder. Stir gently all ingredients together. Pour the composition in a nonstick pan. Bake in the preheated oven for 40 minutes at 200ºC. Put all ingredients for the vanilla cream in a pot, mix and bring it to boil using low heating. Let the vanilla cream to cool at room temperature. In another pot, mix the 9 tablespoons of sugar, with water and cocoa powder. Bring this to boil also. Add in the cocoa composition the vanilla cream and mix well. Add the butter and mix until everything is well combined and the cream looks soft. Heat the water and add the rum essence and sugar. Stir and let it cool. Now you have the sponge cake, the filling and the syrup. All you need to do is to cut the sponge cake in 3, take a plate and start layering: one sponge cake slice, 1/3 syrup over and 1/3 filling, then the second layer and then the third. Cover the borders in the cocoa filling and decorate as you like. My mum was always using walnuts on the top and they worked just amazing. Sometimes I just wanted to color it more and I used cake decorations. Whatever you chose to put on top of the cake, this is totally optional.